From the outside, the Margate Residence looks like just another idyllic family home on the Jersey Shore. But look a little closer and you'll see that the beautifully designed house is also a powerhouse of resiliency and energy efficiency. 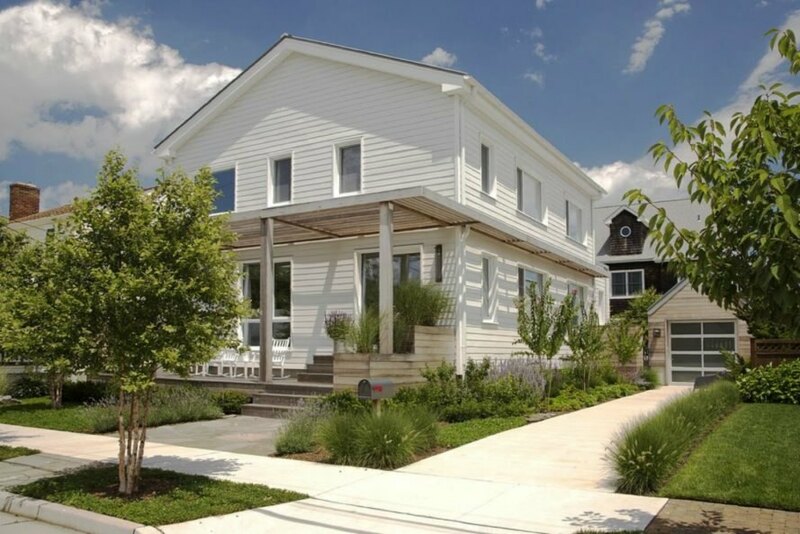 Designed by ZeroEnergy Design, the two-story home uses 85 percent less energy than a new house built to code and is resistant to storm winds and flooding. After their house was heavily damaged by 2012’s Hurricane Sandy, the owners of the Margate residence wanted to rebuild with resiliency in mind, but not at the cost of comfort. Accordingly, the architects implemented a number of energy-saving and storm-resistant features into the 2,600-square-foot residence, but without sacrificing the home’s charm. The home’s eco-friendly and storm-resistant strategies were seamlessly blended into its aesthetics. For example, the home is elevated four feet above grade to minimize the risk of flooding, but the extra height is hidden thanks to strategic landscaping. Additionally, the windows are all equipped with a protective shutter system to shield them from flying debris in case of severe winds. For its energy needs, the family counts on a 5kW solar electric system, which provides 60% of the electricity the family uses. Energy loss is limited thanks to the home’s cellulose and continuous rigid insulation and triple-pane windows. In fact, the residence consumes only about 15% of energy when compared to a new home built to current energy code requirements. On the interior, high-efficiency fixtures and appliances were installed to conserve water usage. However, one would find it difficult to focus on this aspect because the interior design is so attractive. The large open floorplan is flooded by natural light, giving the home an airy, refreshing feel. The home consumes only about 15% of energy when compared to a new home built to current energy code requirements. Like so many families in the coastal area of Jersey Shore, heavily damaged by 2012's Hurricane Sandy, the owners of the Margate residence wanted a resilient home design, but not at the cost of comfort. The front porch is open and welcoming. Accordingly, the architects implemented a number of energy saving and resiliency features into the 2,600 square foot residence, but without losing the home's charm. The multiple energy and resilient features were strategically blended into the home design. The home is elevated four feet above grade to minimize the risk of flooding, but the extra height is hidden thanks to strategic landscaping. Additionally, the windows were all equipped with a protective shutter system to shield the windows from flying debris in case of severe winds. For its energy needs, the family counts on a 5kW solar electric system, which provides 60% of the electricity the family uses. Energy loss is limited thanks to the home's cellulose and continuous rigid insulation and triple-pane windows.